The Fuller Center has the honor of serving many wonderful families, fathers and grandfathers across the U.S. and around the world. In honor of Father’s Day this year, we would like to recognize a volunteer favorite, a father and grandfather named Bud Parish. 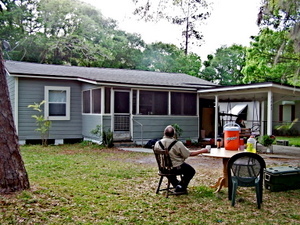 Through our Greater Blessing program, Fuller Center volunteers recently repaired Bud’s Florida home. Bud moved to a suburb of Orlando after retiring from Chrysler and expected to age peacefully with his wife, Sandra. Living on a fixed income coupled with a serious illness led not only to health problems, but an inability to take care of his home. When Fuller Center volunteers first entered it, they found the kitchen had rotted. The house had been neglected for years and attacked by termites. The volunteers could look down through holes in the bedroom floor and see the dirt and grass below. The Fuller Center of Central Florida took on Bud’s house as its first Greater Blessing project and worked on it for months, much longer than expected. 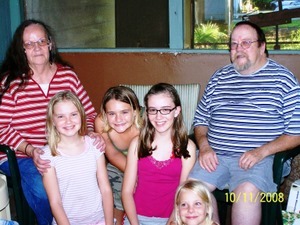 But the volunteers and local staff came to love the family and especially Bud, whom many describe as a true family man. Bud welcomed his granddaughter, her husband and their children – his grandchildren – into his home to live there. All of them are passionate musicians who frequently perform together in putting on concerts of southern gospel music at a local church, performances that the FCH volunteers often attend. Thanks to generous donations and the work of Fuller Center volunteers, Bud no longer has to worry about whether or not to pay medical bills or to pay for home repairs. One of his family members, who has a prosthetic leg, doesn’t have to worry about falling through a hole in the rotting floor. Bud can now enjoy his retirement in a decent, affordable home. Under that same roof, he can provide a safe environment for his family and a warm environment for music making. Or find a Fuller Center near you!